A GMO is a plant developed through a process in which a copy of a desired gene or section of genetic material from one plant or organism is placed in another plant. Genetic engineering is one of a few methods of seed improvement that bring us the foods we eat today. What is a GMO? A GMO is a plant developed through a process in which a copy of a desired gene or section of genetic material from one plant or organism is placed in another plant. The only GMOs commercially available in the U.S. are the following nine crops: soybeans, corn (field and sweet), papaya, potato, canola, cotton, alfalfa, sugar beets and summer squash. Apple is approved and coming to market soon. A GMO is not an ingredient. Ingredients in the foods you eat may be made using one or more of the eight GM crops. GMOs do not equal processed food. Processed foods may contain one or more of the eight GM crops, or they can be made with organic or other non-GM ingredients. Herbicide tolerance. Crops that can tolerate broad-spectrum herbicides, like the agrochemical glyphosate, allow farmers to fight weeds by applying herbicides only when needed and participate in no-till methods that preserve topsoil and prevent erosion. Increased/enhanced nutritional content. Genetically modified soybeans with a healthier oil profile are used in a new, heart-healthy soybean oil. Reduce food waste. A new GM apple that doesn’t turn brown when sliced could help reduce food waste. Provide essential vitamins. Golden Rice, GM rice that contains beta-carotene, could help fight vitamin A deficiency, especially in children and pregnant women. Reduce food allergies. GM peanuts modified for allergens could reduce the risk of peanut-allergy reactions. Note: Farmers do not use genetic modification to increase crop size, create seedless varieties, etc. These crop traits are created through good farming practices, cross-breeding or hybridization. 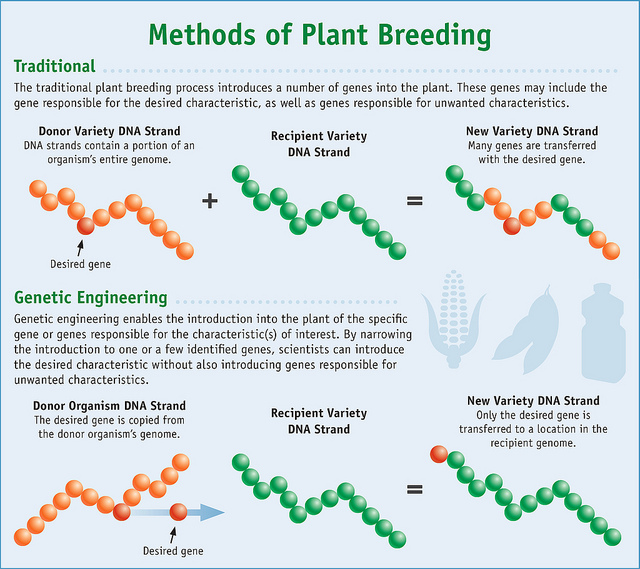 Learn more about the different methods of crop breeding here. Common misconceptions about GMOs: You may have heard that GMOs are untested and unregulated. This couldn't be further from the truth. GMOs are the most regulated and tested product in agricultural history. Click here to find hundreds of studies on the safety of GMOs. Click here to find thousands of independent studies. GMOs take years and millions of dollars to come to market. Click here to find out how much time, money and research goes into every GMO you eat before you ever see it. You've probably heard that GMOs cause cancer, autism, gluten issues or other illness in animals or humans. While this makes for good news, it is blatantly false. In 20-plus years on the market, GMOs have not caused or contributed to a single illness or death. This is not industry hype; it is common and accepted fact. Every leading health organization in the world stands behind the safety of GMOs. Extensive and continuous studies on GMOs are being conducted to ensure their ongoing safety for consumption. Your questions about GMOs: Consumers have many questions about GMOs. We identified the top 10 such questions and are answering them here. If you have questions that aren't included in those 10, we encourage you to ask them here.